Freud's Nephew and the Origins of Public Relations In the 1920s and '30s, Sigmund Freud's nephew Edward Bernays used his uncle's ideas -- sometimes to Freud's consternation -- to help create the new field of public relations. His influence can be felt today, including the very notion of a hearty breakfast. 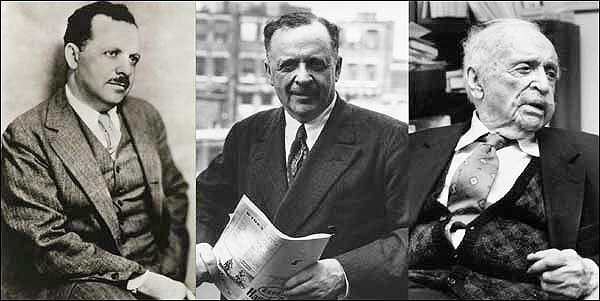 Public relations pioneer Edward Bernays, shown (L to R) from the late 1920s to early '30s, the mid- to late '40s and 1990. Years ago, Americans grabbed toast and coffee for breakfast. Public-relations pioneer Edward Bernays changed that. Bernays used his Uncle Sigmund Freud's ideas to help convince the public, among other things, that bacon and eggs was the true all-American breakfast. He took Freud's complex ideas on people's unconscious, psychological motivations and applied them to the new field of public relations. This story is part of a series commemorating the scientific breakthroughs of 1905. That was the year Freud published his seminal work, Three Essays on the Theory of Sexuality, and Albert Einstein published most of his important papers.